The 2011 Shelby GT350 Mustang took center stage at the 2010, 39th annual Barrett-Jackson Opening Night Gala celebrating the 45th anniversary of the Gt350 and the big block Cobra. 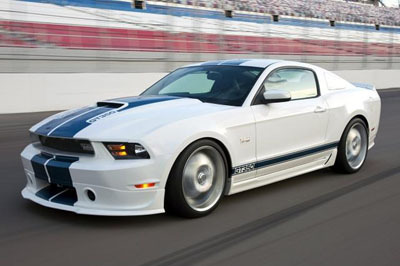 The 2011 Shelby Mustang featured the traditional white paint matched to the iconic Guardsman Blue Stripes, so familiar to enthusiasts. The new car features additional upgrading from Ford Racing for the 2011 Mustang base, including the GT350 Shelby body kit and fascia, A-pillar gauges, and special identification badges. 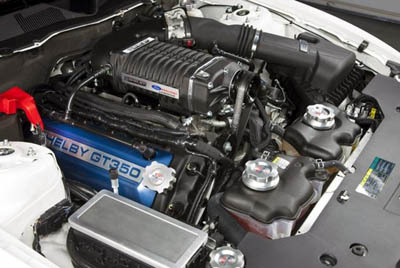 For power, the 2011 Shelby GT350 features Ford's new 5.0 liter V8. 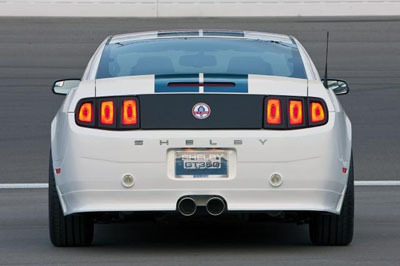 The Shelby American crew worked with Ford Racing to add a supercharger with a goal of generating a solid 500 horsepower. A 6 speed transmission transfers all that power to the 19' Cragar Wheels and some sticky Goodyear tires. The suspension has also received massaging from Ford racing as well and includes a new Baer braking system and a cool Borla center exit exit exhaust A-la Ford GT. The price is expected to command a $33.995 premium over the base 2011 Mustang GT. Talk about stealing the Camaro's Thunder! Ok Ford. what's next? Want to win a brand new customized 2011 Ford Mustang GT with its awesome 412 horsepower coyote V8? Don't miss this! Here's a link to all the details of the Mustang 5.0 Fever Sweepstakes and how to enter.